This workshop was originally scheduled in October but was postponed because of the storm. If you're in the area and have the time, it should be a restful and rewarding day. Making books combines the calm and comfort of handwork with the opportunity for reflection. 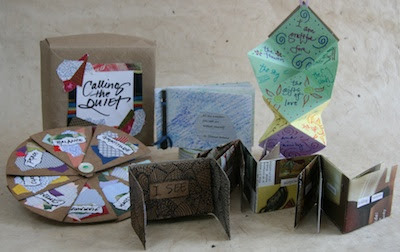 Using recycled materials, we'll make five simple books on a variety of themes and a box to hold them. No art experience or creative confidence is needed; this workshop is truly for everyone. Register online or by calling the office, 978.682.8815.
this workshop looks wonderful, susan, i love the concept. wish i lived closer.